Just over one hundred years ago, a Swiss priest had an unusual idea. Abbé Joseph Joye was a Jesuit and taught children at a Basle school. Around 1902-03 he had the idea that one way to capture the attention of his charges would be to show them films. He was not particularly unusual in this alone. A number of clerics around the world about this time decided to add moving images to the magic lantern shows and lectures, noticing how much the young were attracted to the visual, and simply adding another element to their evangelical armoury. What was remarkable about Joye (pronounced Jwa, by the way) was the scale of his endeavour. While others ordered a few films from an exchange and then returned them, Joye bought his films, kept them, and built up an archive of over a thousand titles over the period 1905-1914. He purchased them second-hand, and as he lived in the German-speaking quarter of Switzerland, the films (some of which he smuggled over the German border, according to legend by hiding them in the folds of his cassock) all had German titles, though they came from countries all over the film-producing world. Joye showed the films to child and adult audiences, and though his interest was educational, he was broad (not to say catholic) in his tastes, selecting dramas, comedies, fantasies, travelogues, newsfilms, industrials, trick films, science films, animation films – the whole rich panoply of early cinema. Joye died in 1919, but his film collection remained at the Basle school (the Borromäum – which still exists). It was in the 1960s that Italian film historian Davide Turconi (1911-2005) came across the collection in Zurich, where it had been moved by Jesuit Father Stefan Bamberger to better storage conditions. Turconi recgonised the huge historical importance of the collection, but could find no institution locally able to take on a collection of such a size, and fearing that the films would be entirely through deterioration, he decided to clip a few frames from each print and save these at least, as a record of what once had been. Turconi’s fears were, happily, misplaced. In 1976 the British filmmaker David Mingay came acros the Joye collection, and through him the collection was taken in by David Francis, Curator at the National Film Archive in London, which had the resources necessary to manage such a large nitrate collection. Around 1,200 prints were copied, catalogued and preserved, and today form one of the most important of all early film collections. But meanwhile, what of Turconi’s frames? Progressively he handed these over to film archives, archivists and historians: to Paolo Cherchi Usai, to the Cineteca del Friuli, to the Arts and Culture Department at the Province of Pavia, to the Cineteca di Bologna, and to Italian film historians Aldo Bernardini and Riccardo Redi. In 2004, Cherchi Usai was at George Eastman House and donated his frame stills to GEH for long-term safekeeping; Bernardini, Redi and the Cineteca del Friuli later followed suit (the frames in Pavia and Bologna are now held by the laboratory La Camera Ottica at the University of Udine and the Cineteca di Bologna). In 2000 the Giornate del Cinema Muto and the L. Jeffrey Selznick School of Film Preservation at George Eastman House initiated a project to conserve, catalogue and digitise the entire Turconi collection. Undertaken by various Selznick students and now managed by Joshua Yumibe in collaboration with Paolo Cherchi Uai, the results of the project have just been published. The Turconi Project is a database of 23,491 film clippings taken chiefly from the Joye collection (c.1897-1915), though some later clippings from unidentified sources date up to 1944. Each image has been digitally scanned and data added to an online database, given (where known) title, country, date, production company and technical details. The entire collection has been made freely available in this way, hosted by the Cineteca del Friuli, and searchable either in its entirety or by the fields named above, including items showing hand-colouring, stencil colouring, tinting, toning, intertitles, splices, and image deterioration. Though there is something a little odd about a collection of clippings taken from a fully preserved collection of the films themselves being offered as a resource in its own right, this is nevertheless a marvellous offering. There are any number of combinations of fields that you can come up with, though take note not to fill into too many fields when searching, because not every field has been filled in for every record – there are many unidentified films, and many without country or date records. But what most are going to want to do is to browse through the database as a whole and savour the Aladdin’s cave of rich images. There is no easier way of getting a sense of the look and vaeitry of early film than by browsing through the collection, and there will be interest here not just from film historians but students of design, culture, art history, photography and much more. There are also copious cataloguing notes (under ‘details’) which note everything the cataloguer has found out about the images, both technical and filmographic. For the specialist, these will be engrossing reading. The project naturally invites any corrections that those knowledgeable in the subject can supply (email them at turconi.collection@gmail.com). What one senses, however, is that a great many of these films have been identified by the BFI National Archive, which had the advantage of cataloguing from entire films (or rather films entire except for a few frames missing). How much work has been done to marry up the two collections? The website does not say. How wonderful it would be if there could be a bringing together of clips, data, catalogue records and films into a single online resource. It’s the sort of project that forward-thinking educationalist Joseph Joye would take today if he could. Let’s hope that the Turconi Project is a first step towards something even greater. 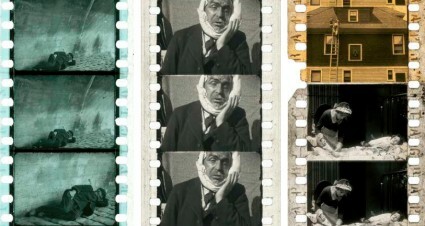 there is indeed a plan to rationalise the information held on the film at the BFI National Archive with that on the database – now we have soemthing to look at and a place for the data – it’s a great site! Terrific news- just what is needed.